Somos Educação (previously known as Abril Educação) is the largest basic and pre-university education company in Brazil and is a leader in textbook publishing publishing over 3,000 titles and holding a 29% market share. In total across the entire product catalogue Somos serves more than 130,000 schools and 30 million students. Twig Education has partnered with Somos to distribute all Twig and Tigtag content in Brazilian Portuguese for distribution to private schools in Brazil via Somos learning system Sistemas and other quality learning services. Carolina Biological has been providing US educators with the finest products and services for the last 91 years, helping students of all ages learn and understand science using real world materials and curricula. Carolina is Twig’s partner for providing hands-on kits to schools in North America as part of the Twig Science NGSS program. Santillana is the leading textbook and general-interest publishing group in Spain and Latin America, with more than 125 million books sold each year. Part of the Prisa Group, the company has been synonymous with quality, innovation and service to teaching staff since its inception in 1960. Twig Education is pleased to partner with Santillana for distribution in Spanish to schools in Chile. Cogbooks are an adaptive learning company who, amongst other projects, create bespoke courseware for tertiary students in the United States. Twig Education are proud to have collaborated with Cogbooks on the pilot of their Biology Courseware at Arizona State University which has been a great success since launching in 2015. STEMscopes is a digital science solution for K-12 students offering three core curriculum programs, STEMscopes K-12, STEMscopes NGSS, and STEMscopes Early Explorer. Born from the lab and penned by the hands of expert teachers, STEMscopes has always had its ear to the ground, taking in feedback, best practices, and the latest pedagogy to develop the most effective STEM curriculum. Fully integrated into their curriculum resources, Twig Education’s world-class films adds another dimension to STEMScopes award-winning products. Focusing on education and training, Maskott was founded in 2004 by teachers with a proven experience in education and ICT training at all levels. Maskott provides efficient and universal pedagogical solutions designed to match a school’s education needs. Their premier product is Tactileo Classroom, an award-winning LMS in which Twig Education’s content is housed and readily accessible to all their educational customers. With 140 years of experience, H. Aschehoug & Co is the leading Norwegian publishing house for textbooks for every level of instruction. Twig Education is pleased to work with Aschehoug to include Twig films in three Norwegian languages – Nynorsk, Bokmål and Sami – within a range of digital textbooks for secondary schools. The National Centre for Educational Materials is a state-run publishing house, under the auspices of the Ministry of Culture and Education in Reykjavík, Iceland providing educational material to students of primary and upper secondary schools in Iceland. NCEM publishes educational materials in accordance with the national curriculum guidelines for schools, issued by the Ministry of Culture and Education and the Centre's own checklist. Twig film content is now available with Icelandic captions to over 20,000 students nationwide. GLOBED are Turkey’s premier supplier of digital education resources and hardware to Turkish private schools. Based in Istanbul, GLOBED’s success is built on their focus on in-person communication and pedagogical rigour which allows their customers to get the resources and services required. 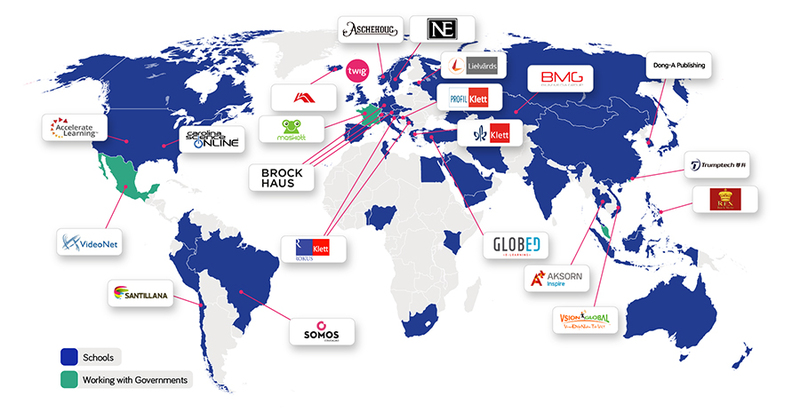 As well as Twig Education, GLOBED represent some of the world’s premier digital education companies. The Rokus Klett Publishing House, part of the Klett AG group, is the largest publisher of textbooks and interactive educational materials in Slovenia. In 2013, Twig Education partnered with Rokus Klett to include Twig and Tigtag film content in Slovene within a new collection of advanced interactive materials in accordance with the Slovenian curriculum, under the brand iRokus+. The interactive learning pack is comprised of an interactive textbook accessible at www.iRokusPlus.si (or as a tablet application) and a printed activity book to be used alongside the interactive textbook. Aksorn Charoen Tat ACT Company Limited, founded in 1935, operates Thailand’s largest educational business and is currently the leader in integrated learning materials. In 2014, the company has established Aksorn Inspire to develop digital educational resources to cope with all learning needs in the digital age and simultaneously, promoting skills-based learning for Thai students. Officially launched in Thailand viawww.twig-aksorn.comandwww.tigtag-aksorn.com, Twig Education is ready to provide new learning experiences in both Thai and English for teachers and students from November 2014 onwards. Bilim Media Group (BMG) is the biggest e-learning company in Kazakhstan, offering online educational content to 2.5 million school students in Kazakhstan, as well as their parents and teachers. In 2014, Twig Education and BMG successfully launched a cobranded website www.twig-bilim.kz, which seamlessly delivers Twig film and learning material content in three languages – Kazakh, English and Russian. Dong-A Publishing, a member of Hansae Yes 24 Holdings, is the number one textbook publisher in South Korea. With the greatest market share in middle school science and with its textbook being used by over 350,000 students, Dong-A has developed the most educational applications in Korea and the first elementary school study-aid apps and textbook apps in Korea. Twig Education and Dong-A Publishing have partnered since 2012 on distribution of Twig and Tigtag content in South Korea. Since 1996 Trumptech has been a pioneer in using information technology to enhance teaching and learning as well as providing educational assessment solutions to schools, parents and students throughout Hong Kong and Southern China. Trumptech and Twig Education have been collaborating since 2011 to distribute Twig and Tigtag in English and Chinese to government and international schools throughout the region. VsionGlobal Corporation is a leading education solutions provider, delivering the world’s best technology, ICT and digital resources to support and engage the education system in Vietnam. Twig Education and VsionGlobal partnered in 2014 for distribution of Twig and Tigtag content to schools and government districts throughout Vietnam. Twig Education has been working closely with the Singapore Ministry of Education to bring our award-winning films to 350+ schools across the country.